Lord’s, September 2012: the site of Hampshire’s white-ball trophy, a victory over Warwickshire by way of losing fewer wickets that you expect would have transfixed everyone associated with the club. On Saturday, Hampshire return to the home of cricket for the Royal London One-Day Cup final against Kent. 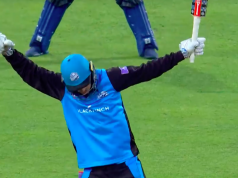 This time, Alsop will not only be watching but he will be front and centre, walking onto the hallowed turf shoulder to shoulder with his teammates, some of whom played in the final six years ago. “Some of the dressing room were obviously there and at the start of the campaign they said the people that were there know how special it is. This will be his first final with the club, having been defeated in the semi-final of last year’s T20 Blast. It won’t be his first trip to Lord’s, though, with an appearance for the English Schools Cricket Association against MCC Schools in 2012 and a T20 against Middlesex last year. Alsop has a number of appearances for England at U19 and Lions level, too, meaning he’s used to some high-profile scrutiny. 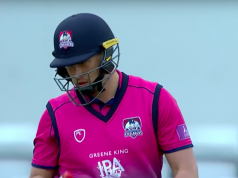 Having not kept wicket at all in 2016, Alsop took the gloves for a handful of games at the end of last season and worked with former Hampshire gloveman Bates this past winter, as did fellow wicketkeeper Lewis McManus. Alsop was given the gloves in the club’s last two Specsavers County Championship matches. Hampshire’s preparation for the final has been far from ideal. The two limited overs blocks introduced last season were, at least in part, designed to prevent players switching between the two formats and four-day cricket in a short space of time. Yet, as both Hampshire and Kent have discovered, the trade-off for success in either limited overs game sees a return to that problem. Kent’s schedule, admittedly, is the least arduous: a Championship trip to Gloucester, a pair of One-Day Cup knockout games, then Championship matches with the red ball at Tunbridge Wells and pink ball at Cheltenham, before Saturday’s final. Hampshire, meanwhile, went from last Monday’s semi-final against Yorkshire to a day/night Championship match against them from Wednesday to Saturday — both at The Ageas Bowl — before hotfooting it to Old Trafford to play Lancashire a day and a half later. From the outside, the schedule hardly seems fair, but Alsop doesn’t appear too bothered by it. “As a batter, in a weird way it’s quite nice, you’ve got a bit more time, you can leave a ball [in the Championship],” he says. “It’s different for everyone. For me, it’s not too bad. I think the way I play and the way I look at the game, I try and keep it very similar throughout all three formats, upping the tempo in the white-ball formats. He makes a valid point: Chris Wood, who has been so influential in Hampshire’s past white-ball trophies, has played neither Championship match while overseas signing Dale Steyn was rested at Lancashire. The South African will play his final game of this spell on Saturday, although he’s expected to return later in the season.